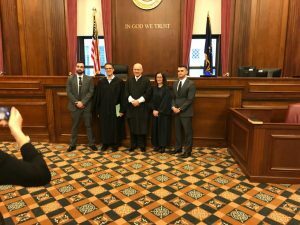 Despite the cold weather at the University at Buffalo in Buffalo, New York, students in Regent University School of Law’s (LAW) moot court kept the competition stoked at the 2019 Herbert Wechsler Criminal Moot Court Competition last month. Out of the 36 teams from across the country that competed in the competition, Regent LAW’s team — Nathan Hernandez ’20 and Joshua Barbosa ’20 — claimed victory in the final round of the competition. “The final round was probably the most exhilarating experience I have had during my time at Regent Law,” said Hernandez. He received the Best Advocate Award for his strong performance. The competition, named after Herbert Weschler — a key figure in drafting the Model Penal Code — is “the only national moot court competition in the United States to focus on topics in substantive criminal law,” according to the University at Buffalo School of Law. The panel of judges provided a breadth of professional, legal expertise, and included a federal judge from the Western District of New York, an associate justice of the New York Supreme Court Appellate Division, and a constitutional law professor from the Buffalo School of Law. Although it was the first time Regent LAW’s moot court team participated in the competition, Michael Hernandez, LAW professor and coach of Nathan Hernandez and Joshua Barbosa’s team, says Regent LAW teams are likely to return.